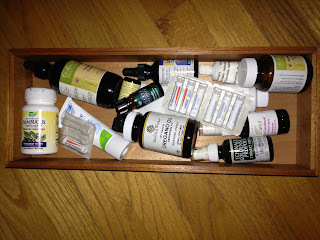 Yeah, I keep Tylenol and Advil in my bathroom, but I've pretty much replaced all my other lotions and potions with homeopathic / natural versions. I am by NO means qualified to dole out medical advice, so before switching to any of these products, do your own research and speak with your doctor! But I just wanted to share some alternatives, in case you were interested! 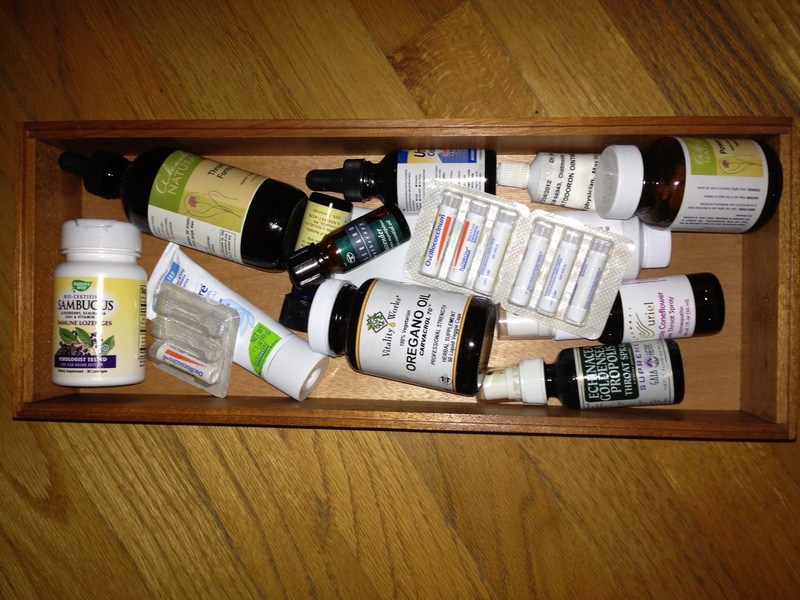 I keep all my natural cures in a drawer in my bathroom cabinet. The key to these products is you can't wait for things to get bad. I.e. treat a sore throat the second you feel a little scratchy. So, let's dive into my alternative drawer! Let's start with a common cold. I attack from all fronts when I start feeling sick. First up, lots of tea and water. Then Oregano Oil which has proven to kill unwanted bacteria, fungus, yeast, parasites and viruses. I also power up the zinc intake and use Umcka cold care drops. And I use Oscillococcinum under the tongue - which is also child safe! For sore throats, I have a few different options. The purple Coneflower spray by Uriel, tastes awful, but it works! My kids are really into those lollipop throat pops (have you seen those?) and I let them have one, but only after they let me spray them with purple coneflower. Another alternative is Echinacea Goldenseal Propolis throat spray. Finally, Sambucus elderberry, echinacea, zinc and vitamin C immune lozenges work great. Doodle tends to be susceptible to odd skin rashes and eczema. For this I use Calendula Thuja Flora by Uriel. Finally, with all my RA joint pain, I'll reach for the arnicare after a bath and rub it into anywhere that hurts. This is also very child safe if a child has a bruise or a bump that is bothering them. For headaches, I rub drops of peppermint oil into my children's temples. And there you have it!! I have an arsenal of herbs I take as well, but we can dive into that another time!